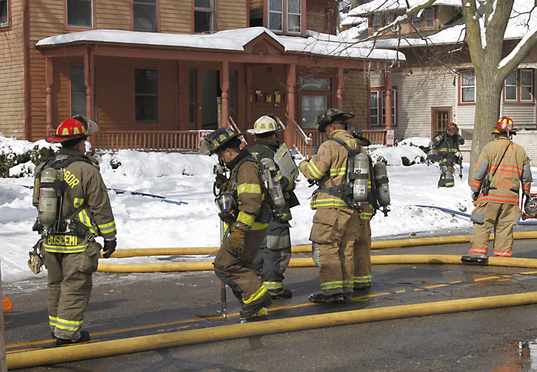 Firefighters regroup after extinguishing a fire in an apartment house on North Adams Street in Ypsilanti today. A fire this morning damaged two units in an apartment house in the 300 block of North Adams Street, Ypsilanti fire officials said. No one was injured in the 11:30 a.m. blaze, which broke out on the second-floor of the two-story home, fire Capt. Dan Cain said. The cause of the fire is under investigation, Cain said. There are five apartments in the house - two upstairs and three downstairs - but Cain didn't know how many people were displaced. One unit on each floor was damaged. 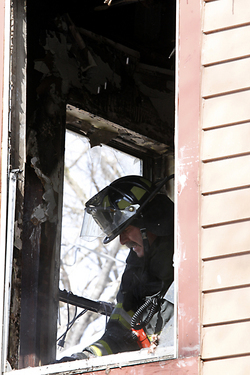 A firefighter checks for hot spots in a second floor apartment of a house that caught on fire today. About 18 firefighters from Ypsilanti, Superior Township, Ypsilanti Township and Ann Arbor responded, Cain said. They had the fire under control in about 15 minutes, he said. Matt Fleming, 29, said he was getting ready for work in his second-floor apartment when smoke seeped into his bedroom. He opened his bedroom door, and the living room filled with smoke, he said. Fleming rushed to his roommate's bedroom, woke him up, and both hurried outside. "I was just glad I was able to get my roommate out of there," he said. "...I was just freaking out." Lee Higgins covers crime and courts for AnnArbor.com. He can be reached by phone at (734) 623-2527(734) 623-2527 and email at leehiggins@annarbor.com.